Feeling captive by your FB pals? Sometimes you have to exit a message. This smiley will help you out of a jam so you can get some much needed work done! Don’t be a hostage to Facebook chat! 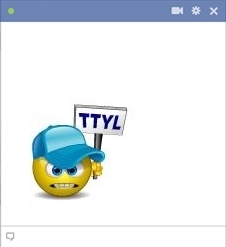 Use this smiley to exit a message gracefully and with a touch of modern-day class!